I'm bored! Seriously, the amount of snow we've had over the last 2 months has made me stir crazy and I can't wait for summer and gardening season to get here! So I've been working on my garden. Planning mostly, but I've started seeds for some of the smaller plants like herbs. Herbs are a great choice to start early because they do well in pots on the windowsill. Plus, herbs transplant into the garden easily once the soil warms up. 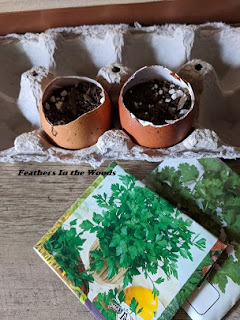 I've been saving eggshells and using them to start seeds. They are perfect for herbs and look so much cuter on the windowsill then those plastic nursery starter pots. The lavender started sprouting and the way it was growing almost made the eggshell look like...well, an egghead! First I started laughing at it. Then I started thinking. Guess what happened next? I discovered a cute and simple Easter craft! Yeah, I have wayyyy too much time on my hands right now! lol These are so easy I probably don't need to explain it, but I'll give you the abbreviated version anyway. When using eggs for cooking I've been cracking them close to the bottom and pouring them out instead of cracking midway through the egg like I normally would. For non-chicken people, the top is the wide end and the bottom is the pointed end. I rinse the eggshell in warm water and let dry upside down. I used my hot glue gun to glue on plastic eyeballs. If the kids are helping then let them use Elmers glue. Draw on facial features using a Sharpie. For these guys I just threw some soaked winter wheat inside and dampened slightly. You can add potting soil and seeds though, it just takes a little longer. Let it grow and voila...egg people! I used the winter wheat because I had it on hand from Growing Cat Grass for the indoor kitties. 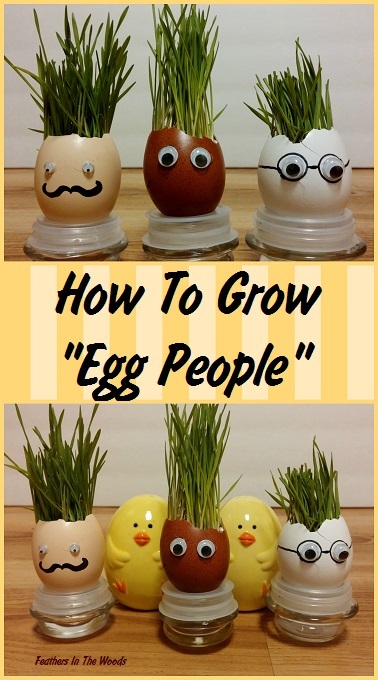 This is awesome because the egg heads were full grown in 4-5 days. The "hair" can be trimmed and it will keep growing for a few weeks. They don't need dirt, only water which is great if you have little hands or paws that might knock the eggs over. Unfortunately wheat only grows straight up, like grass. If you want to use grass seed because it's easier to find (and cheaper, they have small boxes of it at the dollar tree) just add potting soil first and mist with water to dampen. Sprinkle grass seed on top and cover with a thin layer of potting soil. Above all, don't forget to have some fun with it! 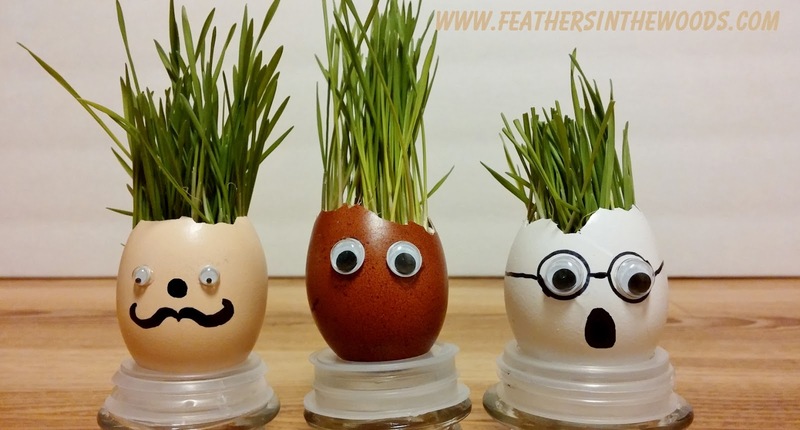 It's not everyday you get to grow your own eggheads! these are so cute! I have to make a few just to giggle at lol :) We are doing a GREEN theme in March for our Snickerdoodle Sunday @ 2crochethooks.com, hope you will link this up! I know I get a smile out of them every time I walk by them on the counter. I'll stop by for the hop...thanks! Awesome! Heading over to check it out now! Thanks! So cute! Dropping by from a conquered mess party! ......and thanks for stopping by! I just love your Google Eyed Egg people and I'm right there with you on the snow this year. My girls will have fun making these adorable 'people'. Thanks! It's another way to use the countless egg shells I have piling up! I hope your girls have a great time making these! OMGosh what a fun idea!! Give it a try, it's super easy! This is such a cute idea. Hello from Clever Chicks. Hello back! Thanks for stopping by!